When you need a part in the middle of a project, like a screw, nut, or bolt, you don’t want to waste 15 minutes looking to find the right one. 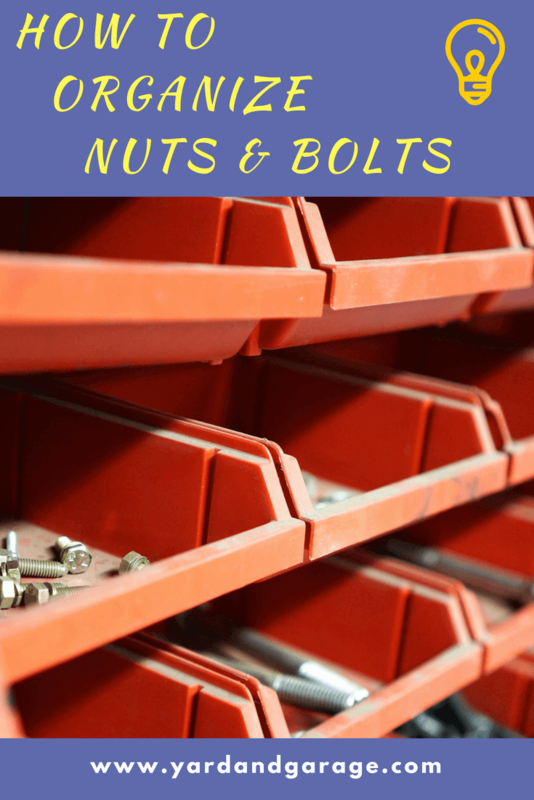 Having a good way to organize nuts and bolts will help you become more efficient and keep you from getting aggravated. I think some people hate working on home projects because they know it will be stressful finding all the right tools and small parts like screws. That’s a shame. Get your garage organized by starting with the smallest things in it: your nuts, bolts, screws, and nail collection. What should the nuts and bolts storage solutions provide? Let’s come up with a few ground rules on what you need from the storage solution before you build or buy one. You don’t want to have to special order something from Germany just to clean up the parts in your garage. It must be available at places like Home Depot, Wal-Mart, Amazon. 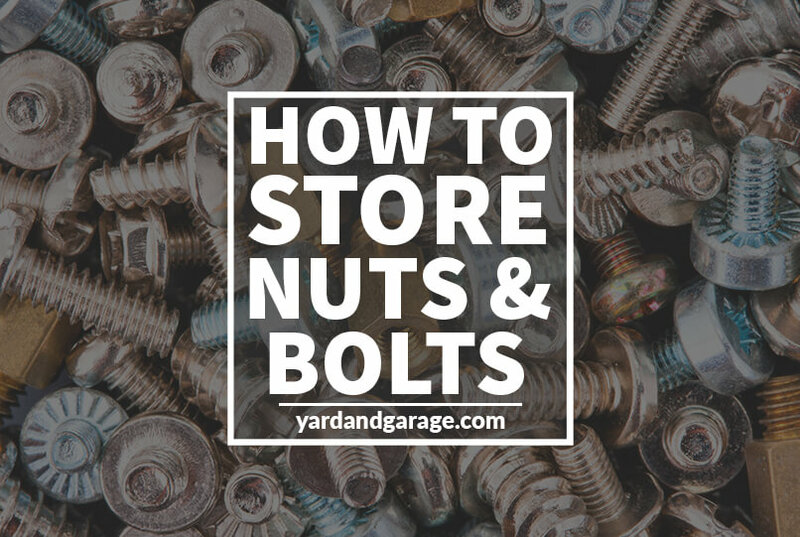 Whatever storage method you use for your nuts and bolts it should be easy to use. You must be able to quickly find the part you need and get back to work. I don’t think you need to spend a lot of money on this. There are pricey metal drawer organizers that professional shops use, but we are just average homeowners. $50 or less for the whole solution sounds about right. 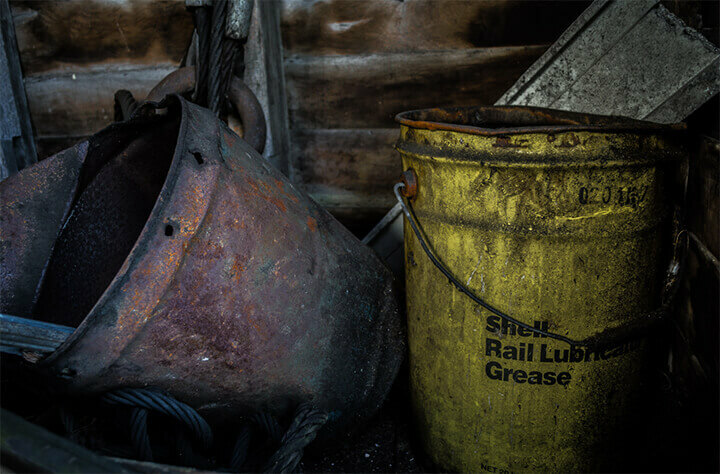 It is really easy to set aside a bucket in the garage and toss any spare parts you have on hand into it. Oh, sure, one day you will get that organized. Maybe you inherited one of these from your granddad. They tend to get passed on from generation to generation. Don’t store your small parts this way. For one thing, it is painful and inefficient to root around in a bucket full of nails. And if you need a part desperately enough you will have to dump out the bucket and look through the whole thing! Another reason not to do this is that any water that gets in the bucket will sit there and ruin your parts. You’ll end up tossing a good bit of money out in the end. Ahh, now we are talking. These drawer bins meet all three of our criteria we set above. Get the kind with clear drawers. That way you can exactly see what’s in there and zero in on the part you need. Don’t paint or tape over them or you will end up playing ‘Let’s Make a Deal’ while you look for a screw. The average size units with ~20 drawers measure 18″ L x 9″ H x 6″ D so you can set up a few across your workbench. You can even stack them if you secure them together well enough. There are a couple of negatives I have found with these plastic bins. You can’t have an individual drawer for every part. They aren’t easy to move around. You won’t be able to use these for all of your tiny parts. There are way too many variations for the number of drawers you can fit on your bench. For some things, you might get away with keeping similar parts in a single large drawer. For example, all wingnuts go in one drawer no matter the size. Also, I wouldn’t recommend trying to move these bins around. I’ve tried it, and of course, all the drawers open up and the screws and nuts flew out. A good version is the Akro-Mils 24-drawer organizer shown above (check price on Amazon). You can choose from 5 drawer configurations to get larger/smaller drawers. For portability, I suggest something else. Clear plastic parts trays are handy when you need to work on something away from your workbench. They come in all sorts of sizes, but I find the ones around 6″ long work best. I can stick a couple of those in my toolbox and go. The version shown on the right are Duofire trays, they come in a pack of 4. They come in different colors so don’t worry about the pink. Click here to check the latest price on Amazon. Try to put similar items together in one tray. For example, put all your washers in one container, separated out by size. This method makes it easy to find what you’re looking for. 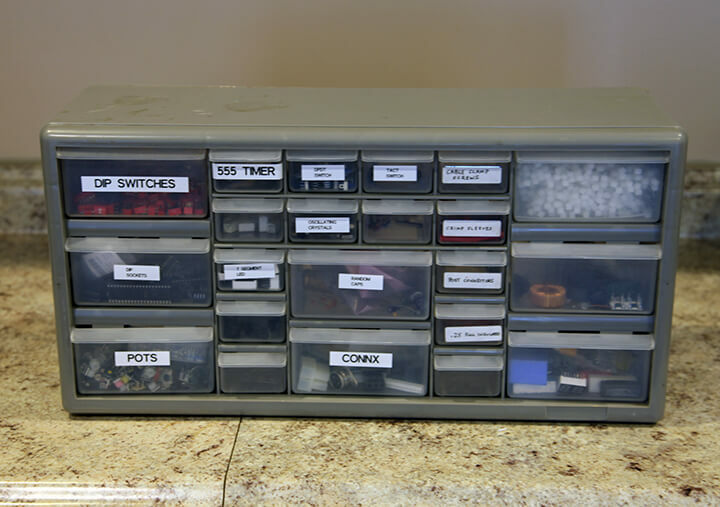 Don’t waste a drawer space in your large standing plastic bin for parts that you only have a couple of. Create a “miscellaneous” tray and put all the weird bits and bobs in it. If you buy the ones with the permanent sections, you will end up frustrated. Those sections are usually around 1″ in size, so they will make the trays useless for longer bolts or screws. If you just pick a random tray at the store, it can be hit or miss whether they are pieces of junk or not. I’ve found the worst offenders are easy to break. Something about the plastic they use makes them very brittle. Also, some crappy versions have tabs that won’t stay locked. There is another portable storage method for bolts and nuts that I have used. It’s the old family tacklebox. Tackle boxes can be used to store your nuts and bolts, and are especially useful when you need to work away from your garage. Removable tray tabs to allow longer sized parts. Telescoping trays so you can find your nuts and bolts quicker. The thing about tackle boxes is that they are kind of related to your personality. I wouldn’t presume to recommend one for you. You probably have a couple laying around the garage as it is. If you need one, Amazon has over 9,000 tackleboxes on their site. 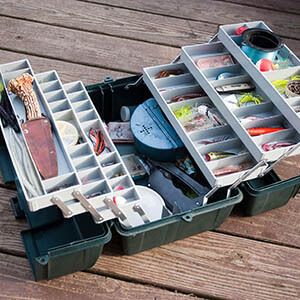 Here are a few of the bestselling tackle boxes on Amazon to help you narrow down your search. If you’ve inherited a bucket of nuts and bolts and you are ready to get them organized, there’s no easy way to get around it. This process will take time, and it can get frustrating. Don’t try to sort a whole 5-gallon bucket in one sitting. Break it up into smaller batches that you can finish in about an hour or so. You can do this task during your favorite TV show. This job is also perfect for kids. It will help them learn about the different parts and how to estimate sizes quickly. They can also earn a few bucks while doing it. Small batch of parts. About a coffee can size. 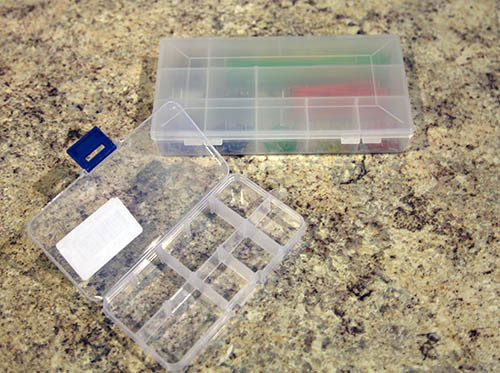 Set up some holding trays, lids, or jars that you can temporarily store parts you are organizing. Have some post-it notes and a pen ready to label them as the parts come in. Lay down some white or light-colored paper on your coffee table. Don’t use newspaper as the nuts and bolts will blend in with the color. Dump the pile onto the paper and start sorting. Use screws and nuts that you already know the size of to use as a reference for the corresponding parts while going through the pile. I like to start with what I can see a lot of. For example, if I find quite a few similar sized nails, I’ll measure one, write down the size on a post-it note and start putting all the same parts in the container with the note. Eventually, you will get down to the one-offs and weird parts. I go ahead and stick those in the “miscellaneous” plastic tray where they will live from now on. If you break this task up into multiple batches, it will help you stay focused and not get discouraged. Don’t try to do it all at once. I hope this guide has given you a little hope that you can get your small parts under control. Everyone can get organized if they put a little effort into it. I do think the plastic drawer bins are the best way to organize nuts and bolts. I use them in my garage and my home office and they work great.